In early 2016, my friend Zach Macias and I came up with a slight crazy idea: why don't we try to make a short animated film from scratch, entirely within 48 hours? 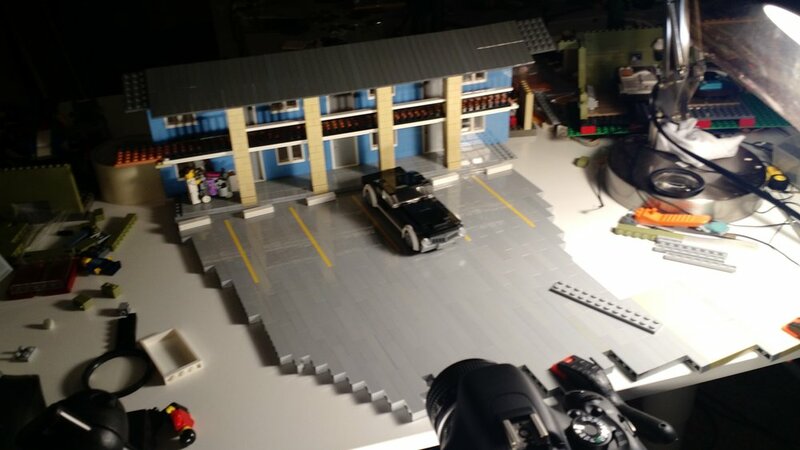 We decided to livestream the whole event in March and invited our friends at BricksInMotion.com to watch. We decided to leave the theme of the film up to the viewers, and they selected "The Secrets We Keep." Very quickly we came up with an idea we liked: two "cleaners" (assassins) have to clean up a crime scene for a crime they just committed. We decided to go for a grungy 1970s crime thriller vibe, and set the story almost entirely within a motel room so we could keep the sets to a minimum. While Zach hashed out the script, I got to work building the set and designing the characters. We managed to shoot several very long and complex shots in the first 24 hours, but the halfway point came and went faster than expected. We quickly realized that despite our best efforts to keep the story small and lean, there was no way we were going to finish the film in 48 hours. Zach returned home and I shot a few more shots by myself. We quickly scheduled another production weekend, and Zach drove up again in April. This time, we we're rushing to meet an unreasonable deadline, we just focused on animating as much as we could before the weekend was up. Some of the shots we animated made use a technique we were trying out for the first time - forced perspective. 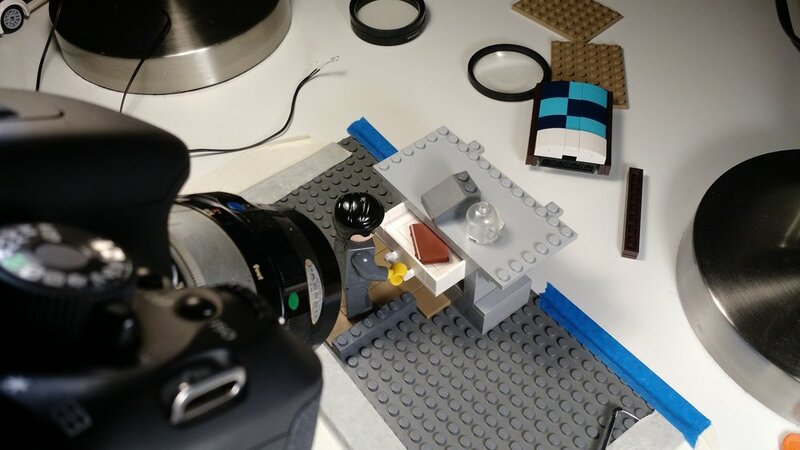 We wanted to shoot some very tight close ups of photographs and the backs of remotes, but we couldn't get that kind of detail at tiny minifigure scale. Recently, LEGO has been releasing larger-than-life minifigures in the forms of keychain flashlights and alarm clocks. These figures are perfectly proportioned to actual minifigures, just much larger. With careful camera angles and some digital post-production manipulation, we were able to use the clocks and flashlights as giant body doubles. We got a lot done in that second weekend of shooting, but the film was still not complete. Zach and I agreed that I could handle the final few shots on my own. During one of the livestreams, another friend of mine, Philip, suggested we use a split-field diopter for a particular shot we were having trouble with. Now that it was clear that production would stretch into a few more months, Zach and I decided to go ahead and invest in a few. Split-field diopters are used when filmmakers want to have both something in the foreground and in the background in focus at the same time. This No Film School article has a lot of great examples of split-field shots in films throughout the years. 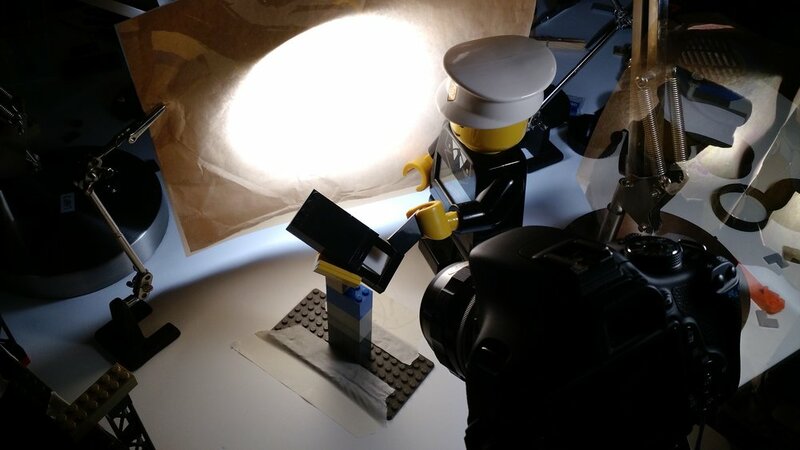 Because of the very small scale of LEGO animation, it's even more challenging to keep foreground and background elements in focus at the same time. After a lot of experimenting and testing, split-field diopters were used twice in The Cleaners: when Ernie holds out a bear trap in the background while Bert cuts away carpet in the foreground, and when Ernie looks down at the remote on the bed. The bed on remote shot needed to be a split-diopter shot because it was important to have Ernie's face and the remote in focus, and doing a focus pull would result in too much lens breathing (another common problem when animating at such a small scale). 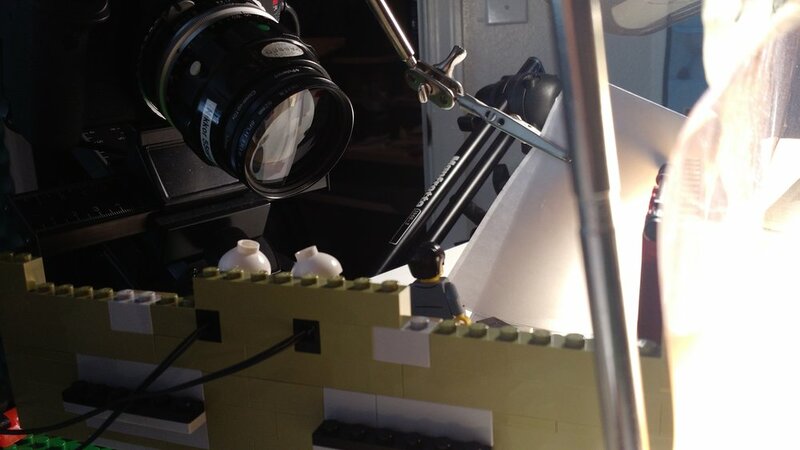 Ultimately using a split-field diopter combined with a tilt down solved the problem. Using a split-field diopter does result in a "seam line" showing up in the middle of the frame, but with careful positioning of the camera and set, it can be generally hidden. Because of the extremities of the framing of the shot, the bathroom bear trap shot had to use a combination of forced perspective and multiple split-field diopters to get Bert and Ernie both in frame and in focus. I finished animating all of the shots over the summer of 2016. After that, we started poking at post-production... and then hit a big slump. The film had taken up a much bigger portion of time than we had expected, and on top of that, both Zach and I were have a lot of stressful situations at our day jobs that were a big distract. Combined with other life events and a general lack of fatigue, we sat on the footage of The Cleaners for two years. We knew we wanted to finish it, and we were really proud of what we had made, but the spark was dimmed until early 2018. For some reason, at the same time, Zach and I got the drive to finish The Cleaners. We jumped into post-production, splitting up the work as I did lots of visual clean-up like removing rigs, while Zach focuses on assembling a rough cut and audio pass. Together we also tackled visual effects such as adding a ticking clock, and a digital headshot. In the end, finally, we we done. Two years later than expected, but still done. And we couldn't be prouder. We both feel The Cleaners is our best work, and we're thrill to have it online finally. If the props, walls, or even floors aren't in the shot, they aren't needed!